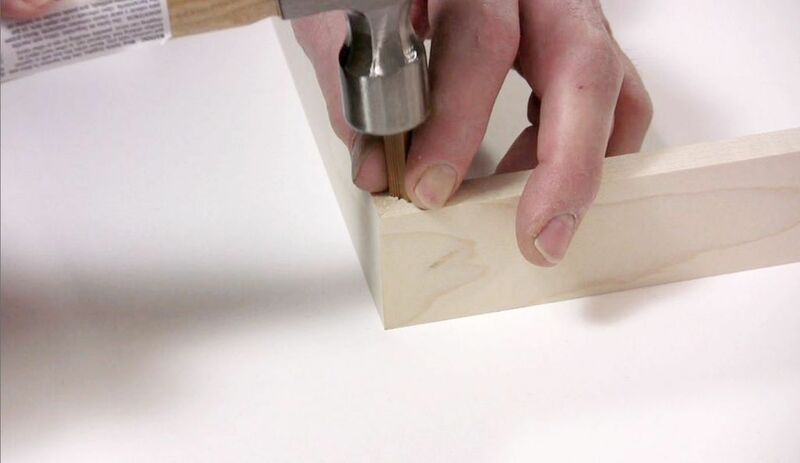 See the technique we use in joining our standard wood frames. Our wedge system which requires no special tools and because it is joined from behind, no holes will be visible from the side. Assemble tools and supplies. 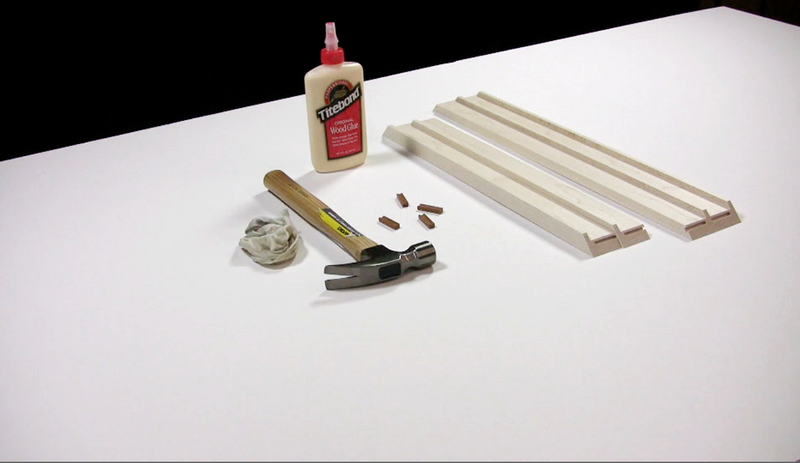 For joining wedges you will need the 4 sides of the frame, wedges, wood glue, a hammer, and a rag. 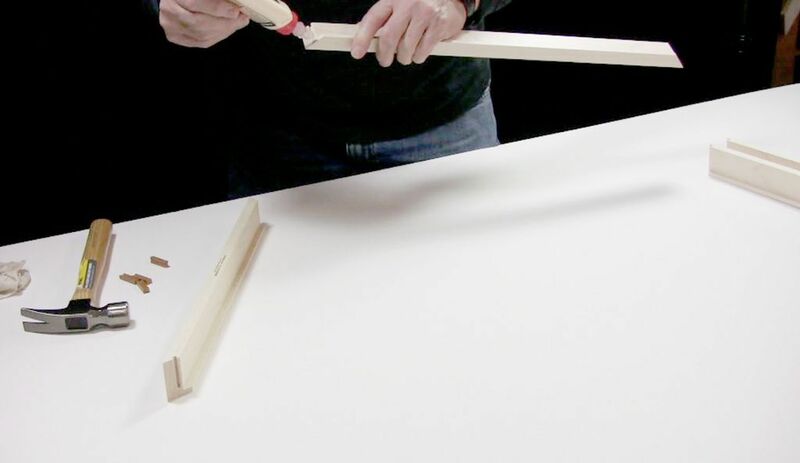 Apply glue to the end of the frame side. Be sure you take one long side and one short side. Arrange the wedges. 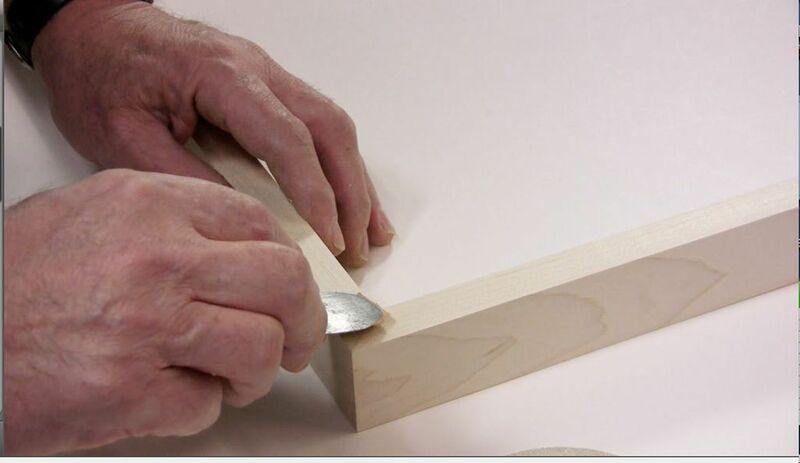 Each wedge has a flat side and a side that is in the shape of a V. To make sure you put the correct side in the frame it is a good idea to arrange them before you start. Place the wedge in the frame. The side with the V will go into the frame and the flat side is the one you will tap into the frame. Be sure he wedge is straight before you start. 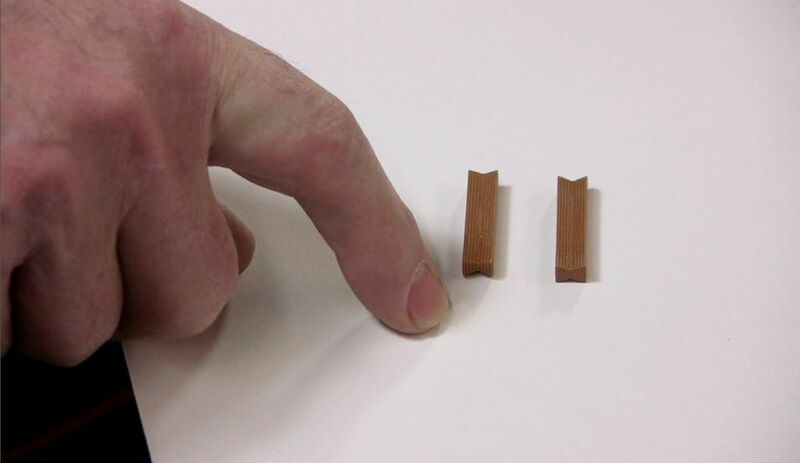 It it is not straight you will split the wood when you tap in the wedge. Tap the wedge into the frame. 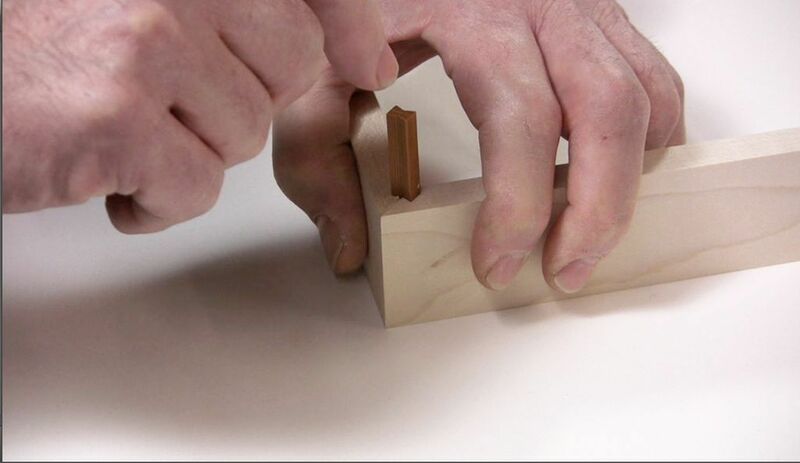 Holding the two pieces tightly, insert a wedge and gently tap it down into the slot. Use a rag to remove any excess glue. Continue the process. When you get to the fourth side put glue on both ends before you insert the wedges. Use your rag to remove any excess glue. 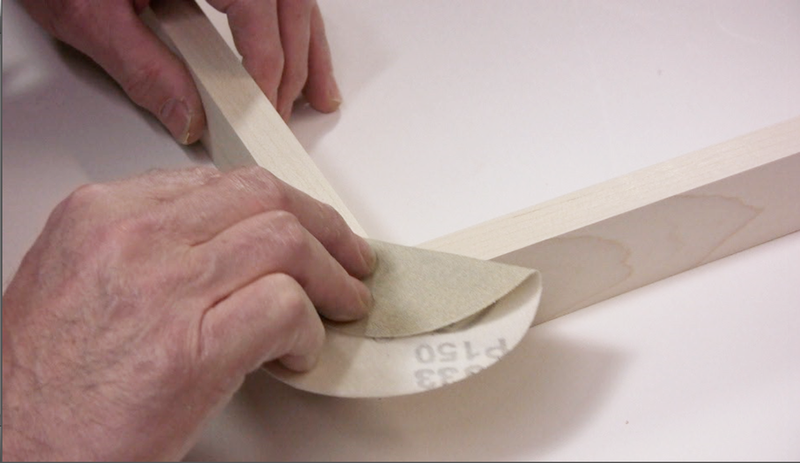 See our page on touchup materials for prefinished frames. 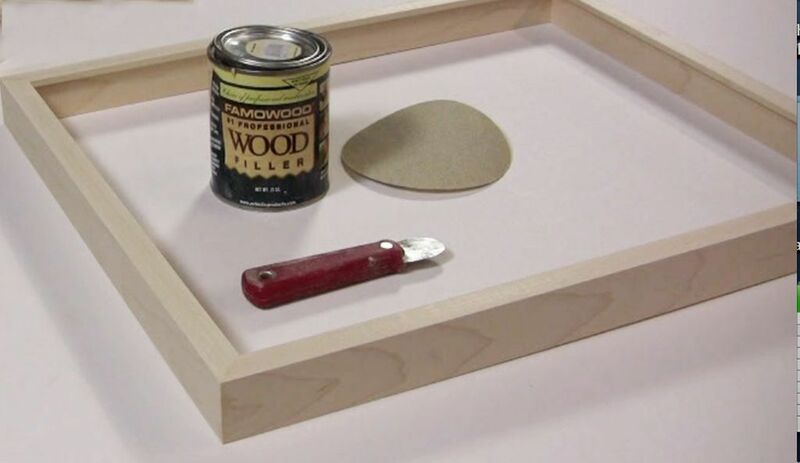 If it is necessary to touchup the frame we recommend you use a wood putty, putty knife, and sandpaper. 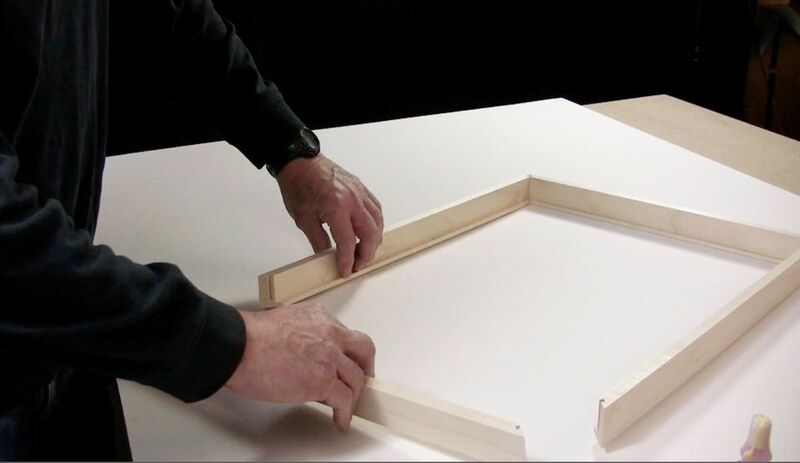 The following gives step by step instructions on how to touchup unfinished frames. Apply the wood putty. Put it on the face and sides of the frame in any area where you see a gap. Sand off the excess putty. Wait for at least a half hour so the wood putty has a chance to dry and sand it off. Editors Note: To touchup prefinished frames we recommend a wood putty or filler which can be purchased at hardware and woodworking stores.